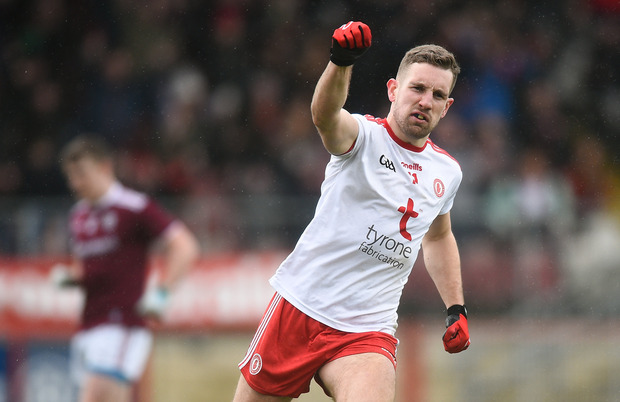 Tyrone have fallen short of a place in the Allianz Division One league final despite a stirring second half comeback against Galway in Omagh. The home side were down by seven points at the break, 1-11 to 0-7, as Galway took full advantage of the strong wind blowing towards the town goal in Healy Park. But within minutes of the restart Galway had realised that the cushion was nowhere near enough as Tyrone piled on the pressure. Once again the focus of direct ball into full-forward Cathal McShane paid huge dividends, with McShane winning a 43rd minute penalty from Michael Cassidy's delivery, which Peter Harte converted to close the gap to two, 1-11 to 1-9. Mattie Donnelly also sustained his strong league form and finished with 1-4, his goal a bizarre 35 metre sidefoot into an empty net, brilliantly finished, after a Sean Andy O Ceallaigh handpass to goalkeeper Ruairi Lavelle, who had ventured out of his goals, was intercepted. Substitute Conal McCann piled on more misery for the visitors with a late goal, courtesy of another delivery into McShane. Galway had been so impressive in constructing that early first half lead. Shane Walsh was instrumental in almost everything, teasing and tormenting his marker Padraig Hampsey with his movement and acceleration. But Kieran McGeary had much more success in the second half. Walsh scored five points, three from play, each one better than the next, though his take-and-go from a superb Ruairi Lavelle kick-out - that must have traveled 90 metres - was arguably the highlight. But Walsh had strong support from Johnny Heaney, who ran in three points, two of which might have been goals with more ambition, while Michael Daly launched two more points on the back of the strong wind. Galway's goal on 17 minutes gave them a cushion after a tight opening quarter, Danny Cummins using his trademark leap to punch home an Antaine O Laoi point attempt that fell short for a 1-3 to 0-3 lead. Tyrone kept in touch though, with McShane providing a great target inside while Donnelly chipped in with two points. They were just two points down, 1-5 to 0-6, after 27 minutes but in the 10 minutes that followed Galway piled it on, outscoring the home side by 0-6 to 0-1 as the pressure applied to Niall Morgan's kick-out told. But Tyrone were utterly dominant after the break as Galway imploded, with Gary O'Donnell sent off after picking up a second yellow card. Scorers - Tyrone: M Donnelly 1-4, P Harte 1-3 (1-0 pen,0-2fs) C McShane 0-4 (2fs, 1m), C McCann 1-0, M Cassidy 0-2, K McGeary, D McCurry 0-1 each. Galway: S Walsh 0-6 (3fs), J Heaney 0-4, D Cummins 1-0, M Daly 0-2, G Bradshaw, A O Laoi (f) 0-1 each. Tyrone: N Morgan; HP McGeary, R McNamee, P Hampsey; M Cassidy, B McDonnell, C Meyler; C Cavanagh, B Kennedy; R Donnelly, P Harte, N Sludden; M Donnelly, C McShane, K McGeary. Galway: R Lavelle; E Kerin, SA O Ceallaigh, D Wynne; G O'Donnell, J Daly, G Bradshaw; T Flynn, C Duggan; J Heaney, M Daly, F O Laoi; S Walsh, D Cummins, A O Laoi. Subs: C Darcy for Duggan (h-t), S Kelly for F O Laoi (42), E Brannigan for Cummins (57), K Molloy for Bradshaw (66).